"Welcome to England at the beginning of the 12th. century. Prior Phillip of Kingsbridge has a glorious vision. He wants to build the largest and most beautiful cathedral in the country. Phillip recruits the realm's most renowned master builders. Together they work on the monumental task, each with the intention to contribute the most to the cathedral. The master builders hire skilled craftsmen from across the country to lend their efforts. Hired workers collect the badly needed resources-stone, wood and sand. Their efforts are critical, for any materials they cannot find must be purchased at the market for exorbitant prices. However, the master builders must worry about more than just the work at the ctahedral. Cunning adversaries aim to sabotage the ambitious project. The nobility, particularly the King of England, will increase taxes and tariffs on a whim. If building plans are hampered by a shortage of goods, the only recourse may be to request the favor of the King. Hopefully, the King will be sympathetic and provide the badly needed resources from his own mines. An audience with the archbishop, skeptical though he may be about the undertaking, may be helpful. Ultimately, the most important help comes from the protection of Divine Providence, for the fate of the cathedral could be hampered by all manner of catastrophes and unfortunate circumstances. The goal remains constant: the magnificent representation of heaven on earth in the form of the cathedral. Who has contributed to this endeavor and gained the most fame? Only the player who best unifies his gold, craftsmen and time will win!" - English rules. This game is based on Ken Follet's novel of the same name and played over 6 rounds. In each round players will first place workers to collect the resources, wood, stone and sand, or use gold to purchase craftsmen that are available in that round. Following this master builders are drawn from a bag and each player as their builders are drawn has the option to place it at one of the locations in Kingsbridge to gain its effect. When all builders have been placed the locations are resolved in order and players gain resources and other advantages (such as craftsmen, privelege cards and victory points). The final location to be resolved allows the use of craftsmen and resources to gain victory points and a part of the cathedral is placed on the board before the next round begins. When the final piece of the cathedral has been placed at the end of the sixth round, the player with most victory points is the winner. 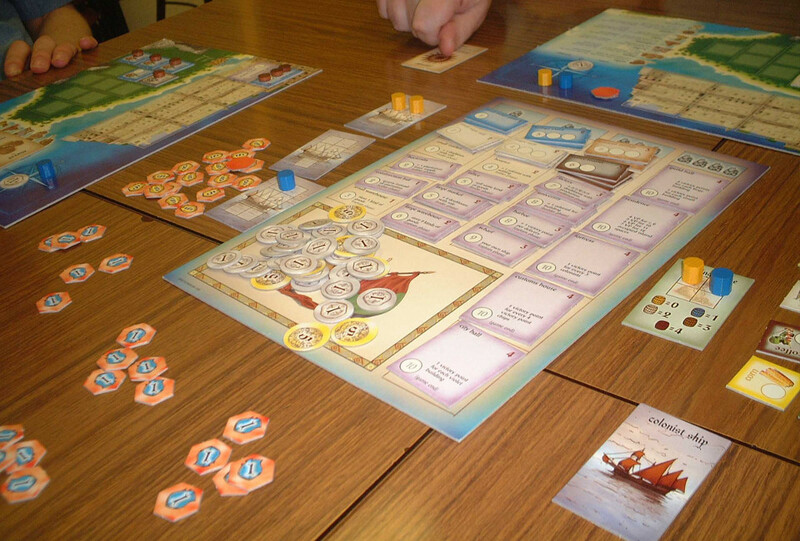 At the club, the game is now most commonly played with the expansion providing extra privelege cards, craftsmen and locations for the placement of workers and master builders. â€œEach player represents a power company, which works to supply electricity to cities. During the game, each player buys power plants at auction, buys resources to produce electricity in those power plants, and builds a network of cities to supply with electricity from his power plants. 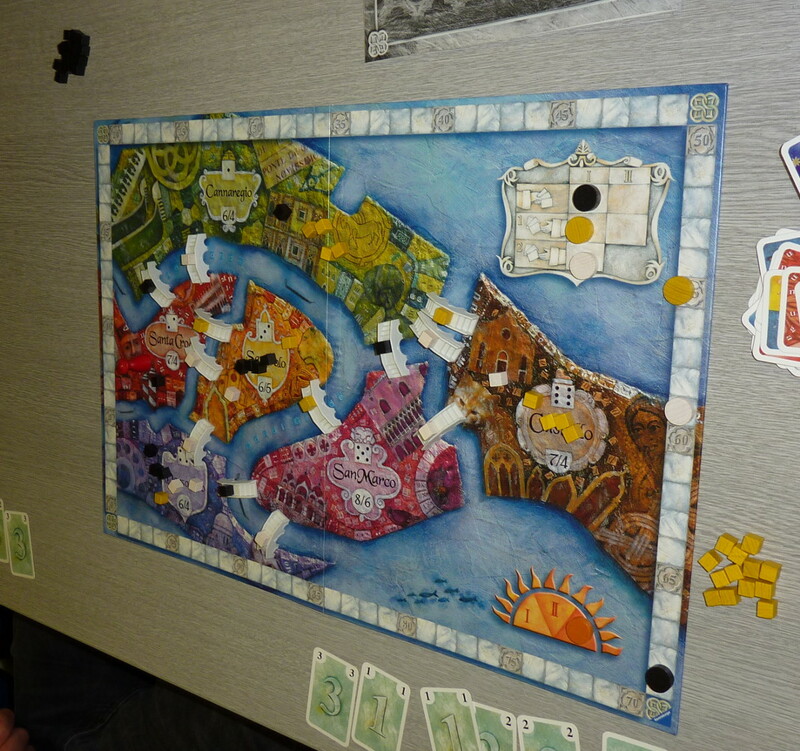 In the end, the player who supplies the most cities with power wins the game.â€� â€“ Rio Grande Games English rules. This is the most played game at the club since it first appeared in 2004. 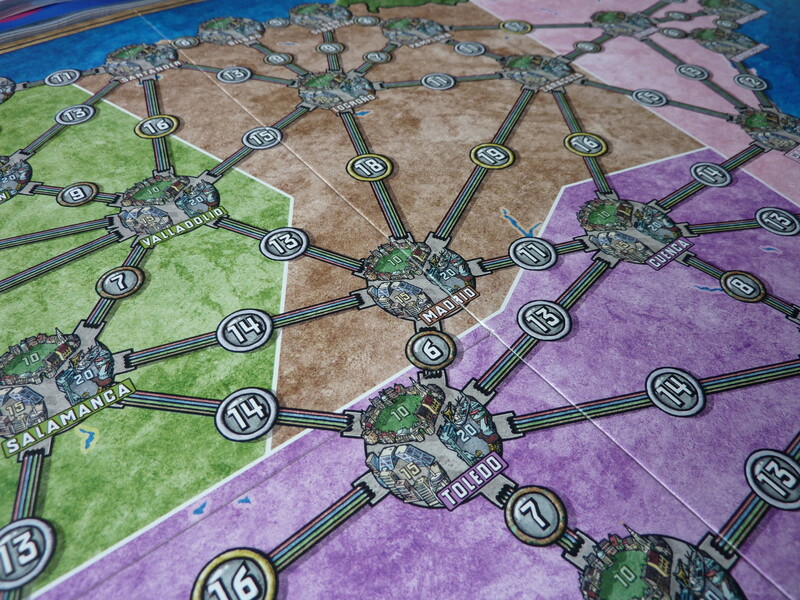 Played on a board showing a map of a country (or group of countries) players compete to link the major cities to their networks and to supply them power. Key to the game is to know that victory will go to the one, not necessarily with the most cities in their network, but the one who can supply power to the most, this being dependent on the power stations they have and whether they have the fuel to run those power stations. â€œProspector, captain, mayor, trader, settler, craftsman, or builder? Which roles will you play in the new world? Will you own the most prosperous plantations? Will you build the most valuable buildings? You have but one goal: achieve the greatest prosperity and highest respect! This is shown by the player who earns the most victory points?â€� â€“ Rio Grande Games English rules. 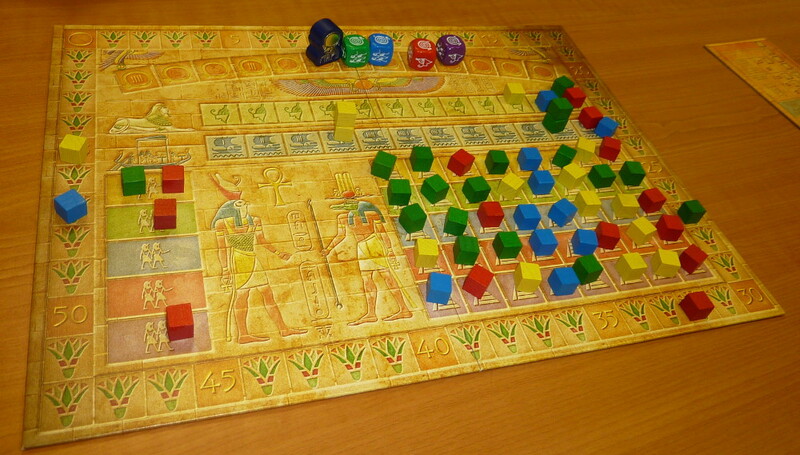 During these epochs, the players acquire tiles representing various aspects of Egyptian life. They acquire the tiles in auctions, bidding with suns, tokens they receive from Ra. The selection of tiles in the auctions is ever changing, but tokens from Ra are limited. 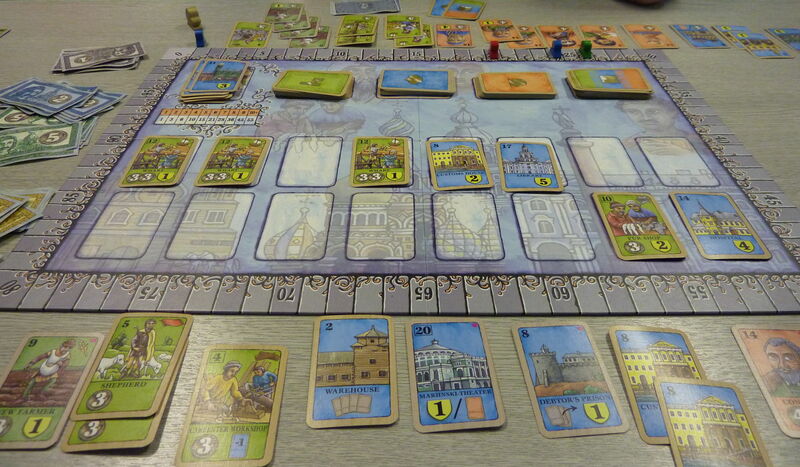 Wise players choose carefully when and what to bid to get the tiles they want. When an epoch ends, players receive tablets marked with the fame they have earned. The player with the most fame after three epochs is the winner.â€� â€“ Rio Grande Games English rules. 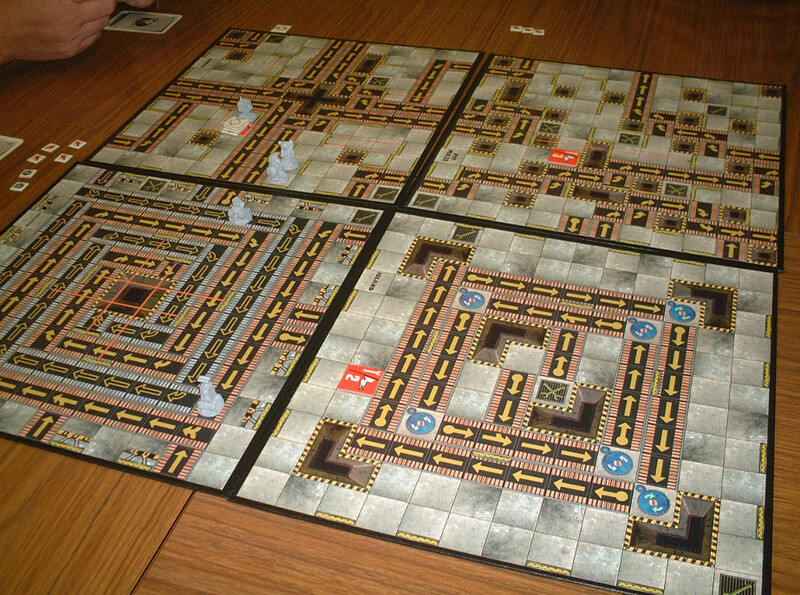 This is a set collection game, where the players will attempt to gather tiles that will score them points. It is played in three "epochs" with each player beginning the epoch with three suns, these will have a number from 1 to 16 and are used to bid for tiles on the display. On their turn the player has the choice to draw a tile from the supply or to invoke Ra, which will trigger an auction. If Ra is evoked, either voluntarily by a player or involuntarily due to the draw of a Ra tile or full tile display, each player starting from the left of the invoking player will have the option to play a sun greater than one previously played until the player invoking Ra has the final option either to play a still higher sun or to pass. Whoever plays the highest sun, exchanges that for the tiles on the display and the sun in the middle of the board, which is turned face down as each player is limited to winning a number of auctions equal to their starting number of suns in each epoch. An epoch ends when either every player has used all their suns or when a number of Ra tiles (dependent on the number of players) has been draw. At this time points are calculated for the tiles a player has, such as Civilisation, Gods, Niles and Pharoah. Additionally after the final epoch only points are also awarded for monument tiles. The player scoring most points throughout the game is the winner. "The game spans 1500 years of Egyptian history. Over many dynasties you seek to expand your power and fame by influencing Pharaohs, building monuments, farming on the Nile, and advancing your civilization. All this for the glory of the Sun God Ra!" - English rules. This is the dice version of Ra (see above) and plays more quickly. The difference is that rather than auctions to acquire tiles, in this version dice are rolled in an attempt to form sets similar to those represented in the original game. As is the case for Ra the game is played in three epochs and the scoring is essentially the same as that game. â€œExplore, Settle, Develop, Trade, Consume, or Produce? Which do you need the most? Which of Earthâ€™s former colonies will be most successful at settling the galaxy, now that JumpDrive exists? Who will discover the secrets of the mysteriously vanished Alien Overlords? Your goal: to build the most prosperous and powerful space empire!â€� â€“ Rio Grande Games English rules. In this tableau building card game, each round the players play an action card face down. The cards are revealed and then the phases of the turn are played out depending on what action cards have been played, if an appropriate action has not been played then that phase will not be played that round. Explore in which players draw cards from the deck and select from them a card or cards to add to their hand. Develop where players may play Development cards from their hands to their tableau paying for them with other cards which they discard. Settle where world cards are played to the tableau and either payed for as in the Develop phase or conquered for nothing if a military world is played and the player has a high enough military strength. Consume, where goods on worlds are consumed in exchange for cards and/or Victory point chips. Produce in which goods (represented by face down cards) are produced on worlds which have that ability. 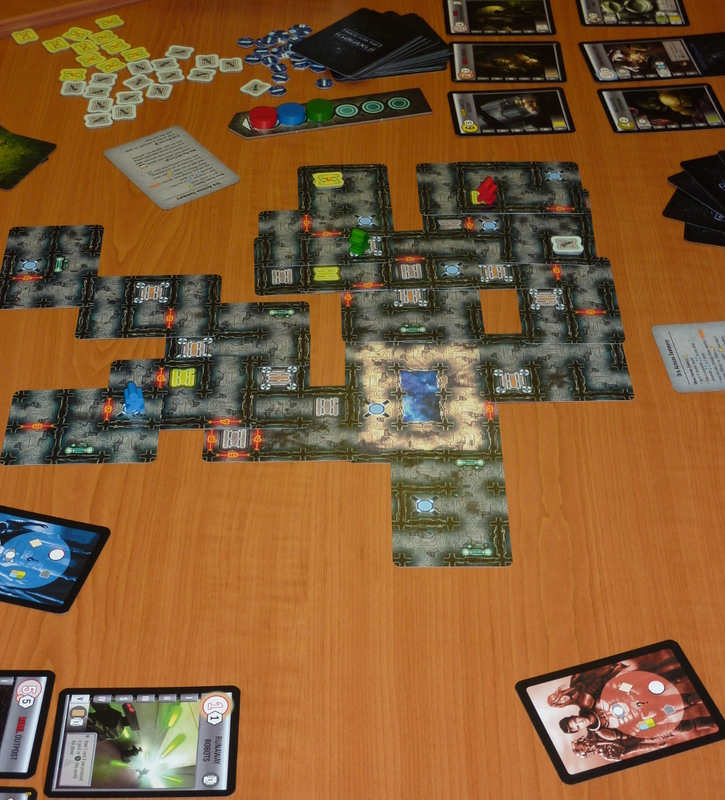 The most recent expansion (Alien Artifacts) adds an additional facet to the game where players move survey parties around a board (represnting the Alien Orb) built of cards trying to collect artifacts which grant both one off special abilities and additional victory points. "The year is 1830. The age of railroading has begun, and you are the head of one of the first fledgling railroad companies. The cities team with potential passengers, the countryside of a young nation gives birth to a bountiful harvest, and countless new factories bulge with finished goods! The potential profits are huge, but who will get there first? The competition will be fierce, and only the best railroads will prosper. You will decide the best routes and build the track. You will run the railroad and deliver the goods, thus capturing that share of the market for your railroad. And as your network of rails expands across the countryside, you will invest in newer, better locomotives to deliver the goods faster and farther. "Get ready to boot up the RoboRallyâ„¢ robot racing game! Each turn, youâ€™ll draw random Program cards, each featuring an instruction for the movement of your robot. Secretly choose five of those cards to plan out your robotâ€™s moves across a perilous course with the goal of being the first to touch all the flags in order. â€œIn 1703, Czar Peter the Great founded Saint Petersburg, which soon became known as â€œParis of the Eastâ€�. The Winter Palace, the Hermitage, the Church of the Resurrection of Jesus Christ, and many other buildings even today beckon visitors from all over the world. But Saint Petersburg was only a part of his numerous activities. Peter reformed the whole of the Russian Empire and brought it from the Middles Ages to a par with Europe of that time. To accomplish this, he needed a new administration and brought the aristocrats under his control. This was also a golden time for the workers as their skills were much needed to reform and build the new Russia. The players will take important roles in the building of SAINT PETERSBURG. The players acquire workers, buildings, and aristocrats and place them in their play areas. These earn the players money, points, or both during the game. For the aristocrats, players can earn additional points at the end of the game. The player who is best able to manage his meager money supply and buy the right things at the right times, will win the game.â€� â€“ Rio Grande Games English rules. "Prospector or governor - councilor or builder? Which roles will you play in the new world? You have only one goal: acquire the most wealth and fame! Who will own the most fruitful production facilities? Who will build the most important buildings? Who earns the most victory points...is the winner!" 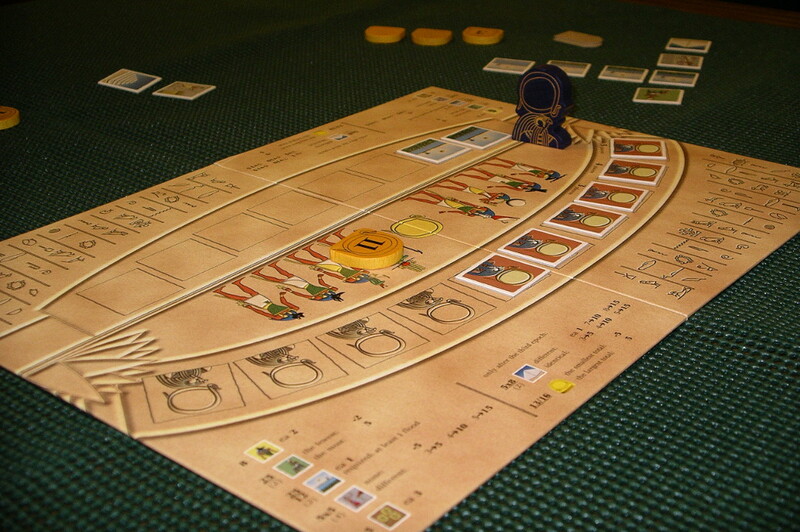 â€“ Rio Grande Games English rules. "Space is getting tight in Small World. There are just too many races living off your land - land your ancestors bequeathed to you in hopes you would build an empire with which you could dominate the world. Picking a fantasy Race and Special Power combination, you must use their unique racial traits and skills to conquer surrounding Regions and amass Victory coins - often at the expense of weaker neighbors. Placing troops (Race tokens) in various Regions, and conquering adjacent lands, you earn Victory coins for each Region you occupy at the end of your turn. Eventually, your race will become increasingly over-extended (like those you have already crushed!) and you will need to abandon your civilization and look for another. The key to your victory is knowing when to push your empire into decline and ride a new one to supremacy in the land of Small World!" - English rules.